The introduction may stay the same but Series 2 of one of this decade's most fascinating television shows jerks you right back into the surrealistic dual life of detective Sam Tyler with a frenetic pace and sense of daring needed to engage in a high speed police chase around Manchester, England in either 1973 or 2006. While we're still in doubt as to whether or not Tyler is in fact mad, in a coma, or a man who has suddenly traveled in time after being brutally slammed to the pavement in a hit-and-run accident while following a lead in '06, the clever writers ramp up the coma theory to brilliant effect as we open with the shocking prospect that someone Tyler busted in the future may be tampering with his life support. Unable to fight someone in his near sleepwalking state especially when that someone is attacking him three decades later, throughout the second series of Life on Mars the pressure on the life support of the character Sam Tyler is similarly increased. Such a smash hit that-- as the writers admit-- there was an enormous demand to let Mars run for an additional four series, they wisely chose to ignore popular interest and instead just serve the story they were telling. They did so by avoiding the temptation to go into a creative autopilot with their psychologically thrilling period police procedural and wrap things up in a mere sixteen episodes which is less than one standard 24 episode season order for American television. However, a good number of the episodes involve not just Sam's plight but some tremendously complicated mysteries for the Manchester Police Department to solve in such an intellectually demanding way that they could almost be considered traditional standalone installments. While I had hoped that Series 2's alternate explanation of just what Sam is doing at that department would've been introduced a tad earlier to fully produce a mind-blowing effect, every single episode can be viewed as a veritable and vital piece of the perplexing puzzle. Despite this, the final episode is such that it moves in so many directions near the conclusion that ultimately you're left to do with the adventure what you will in your own mind. Yet, ultimately it's a rich payoff for audiences who had been keyed in for clues from the opening of Mars' mesmerizing odyssey as the audacious final few sequences hearken back to the very first episode in one extraordinary bookend. In fact, the effect is so breathtaking in its demand for recollection of the opening episode that it would be a wonderful intellectual experiment to view the first and last installments back-to-back. Regardless of the fact that the coma theory pervades the second series and it is likewise the same logical reasoning I was championing as well, it's sheer addictive bliss to witness the way the writers explore the parameters of that possible set-up to an uneasily trippy delight. This is achieved again and again from that aforementioned fight to ward off a future enemy and attack and escalates as Sam tries to ignore the mysterious messages filtering into his subconsciousness (or possibly consciousness) which culminates midway through the series to an accidental '06 hospital overdose which sends '73 Sam reeling. Yet it's hardly "The Sam Story" at all. The second series even more than the first one provides the talented actor Philip Glenister as Sam Tyler's domineering politically incorrect boss DCI Gene Hunt with the show's most challenging and consistently gripping material as he grows closer to Sam both professionally and personally, all the while trying even harder than the younger man to reconcile different modes of policing to a world of increasing danger. As heroin enters the Manchester scene, Gene Hunt debates taking the law into his own hands. And in one particularly arresting episode, an old child murder case comes back to haunt him and his own inner demons come out on a more tangible and less surrealistically existential level than the ones plaguing Sam although John Simm steals focus on the surface because it collides with the "overdose" plot. While Mars theorists never tire of the psychological, literary, and pop cultural influences at work in any given episode as overall both The Wizard of Oz and Alice in Wonderland seem to guide Sam's personal crisis, the one thing the show has never earned enough credit for is its sly sense of humor. Usually the comedy works through the unpredictable remarks of Glenister but in series two's most comparatively lighthearted episode, the writers hand over the honor to Simm. While the death of female makeup representatives for a company in which his favorite aunt was employed hits Sam on a personal level, events take a more humorous and romantic turn in his relationship with his lovely ally, Annie (Liz Cartwright) when they must pose undercover as married swingers. Introducing himself as Tony Blair and later Gene Hunt as Gordon Brown, the episode contains Life on Mars' trademark "big twist" as far as the whodunnit goes while also working in more clues about Sam and the difference in past and present police methodology regarding the new concept of "surveillance" to great comedic effect. Yet it's additionally significant for solidifying the characters' relationships before the series begins to charge full speed into its final shattering episodes that test Sam's alliance to '73 vs. '06 if a choice will be presented to him in the future. Moreover, the series begins subtly addressing problems of the future in the past by providing us with unpredictable closure regarding Sam's '06 Manchester girlfriend in a riveting episode wherein he meets the woman who is carrying his future love in her womb. Even more surprisingly, the series gets a much needed jolt of a fourth possible explanation for Sam's presence and mental flashes in a thrilling turn of events. This development is so unexpected and delicious from a psychological storytelling standpoint that I personally wish the writers would've teased us with it even earlier to throw the coma theory into question, thereby making us just as off balance as Sam. Thankfully including the spoiler warnings which were sadly lacking in the extensive behind-the-scenes documentaries and footage contained in the first set, this time around with titles such as "The Return of Life on Mars" and "The End of Life on Mars," the slim-packaged collection continues the high quality of Acorn Media's previous release with 2.o stereo/5.1 surround audio tracks, 16x9 original cinematic widescreen ratio and English subtitles. 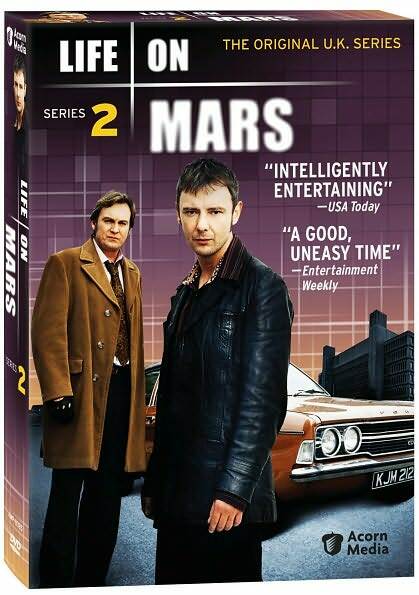 Eventually I can only hope that Acorn will eventually release the Mars spin-off Ashes to Ashes which also stars Glenister as Gene Hunt and further explains what happened to Sam Tyler as far as the police file and Hunt reveal, according to online research. However for now, I'm just thankful that both series were released within the same calendar year and so close together. For once you finally finish up number sixteen and see how it goes directly back to one, you'll want to watch them all the way through in a marathon run. Since the second time around, David Bowie's titular lyrics will ring truer, in asking "you to focus on" the clues now that you have the figurative "seat with the clearest view" to realize just how much "Life on Mars" creators Tony Jordan, Ashley Pharoah, and Matthew Graham provided us with from start to finish. FTC Disclosure: This is not an advertisement nor a paid review. As is standard critical practice, I received a review copy of this set in order to provide coverage and a conclusion to my previous review of the first series of this extraordinary work. Furthermore, Mars deserves more audience attention than a large amount of well-advertised junk currently playing on our airwaves and informed reviews that inspire readers to use thought and choice are the best way to express my reaction to a series that I would be writing about, whether or not a review copy was in my hand.